OK, here we go with another set of photos (and video this time) from ten years ago. 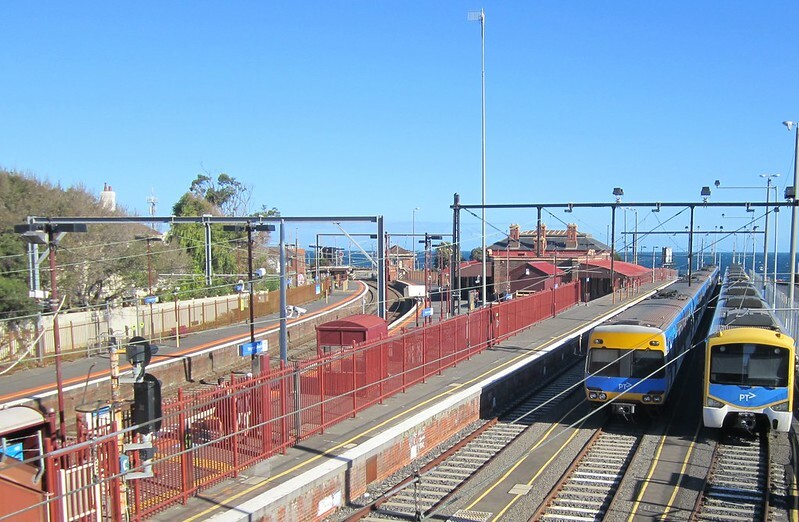 Here it is in the present day: notice the fence along platform 1 for the purposes of securing the sidings, where trains are now kept when not in use. If you look closely, you’ll also see an additional exit on platform 3. And the small shelter (designed for wheelchair passengers) that was under construction in 2005 is now there, as well as a PSO pod (aka “Baillieu Box”). 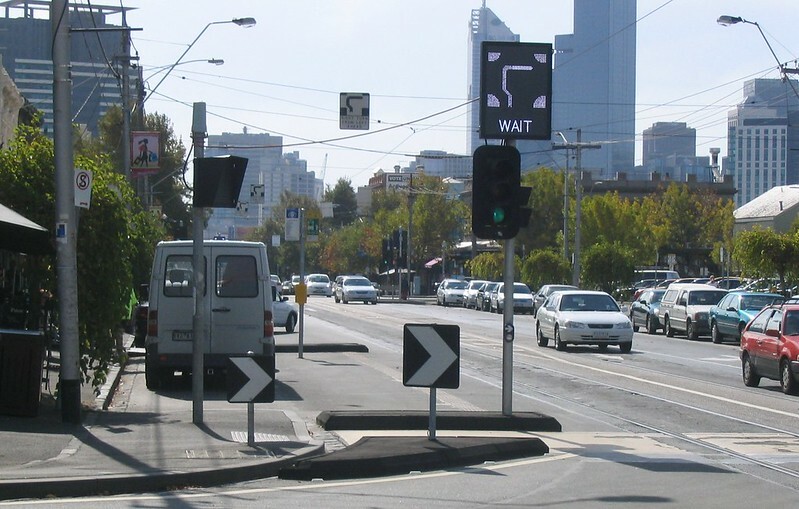 Clarendon Street, South Melbourne, after a somewhat half-baked “Think Tram” solution was put in to include hook turns, departure-side tram stops (but with inadequate markers and barriers, so motorists ended up parking in them). 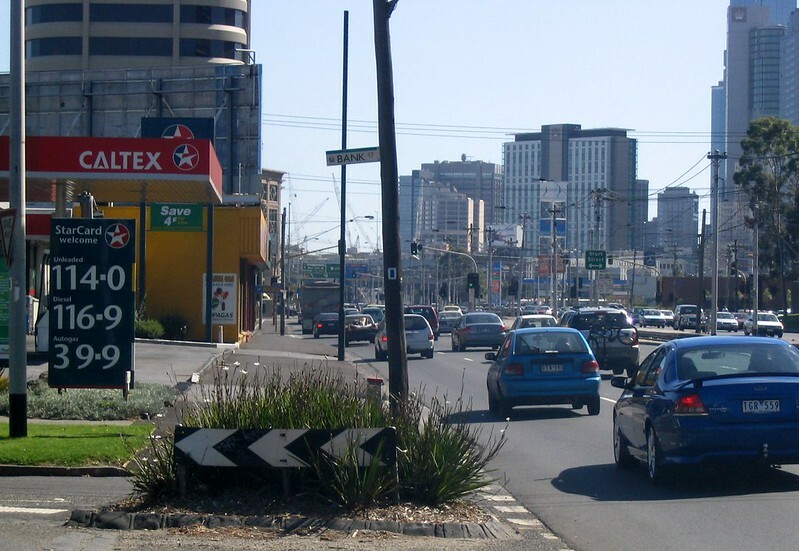 However the hook turn automated signage has appeared at numerous other intersections, in the CBD. Nearby Kingsway. I must have been snapping the petrol price, but note the mass of cranes in the background — perhaps Crown was being expanded at the time, or perhaps it was north of the river? The Nylex sign being renovated (see this blog post from the time). That didn’t go so well — the clock was switched back on in mid-2005, broke down in 2006, and then switched off when Nylex went bust in 2007. It was restarted for a day or two earlier this year. 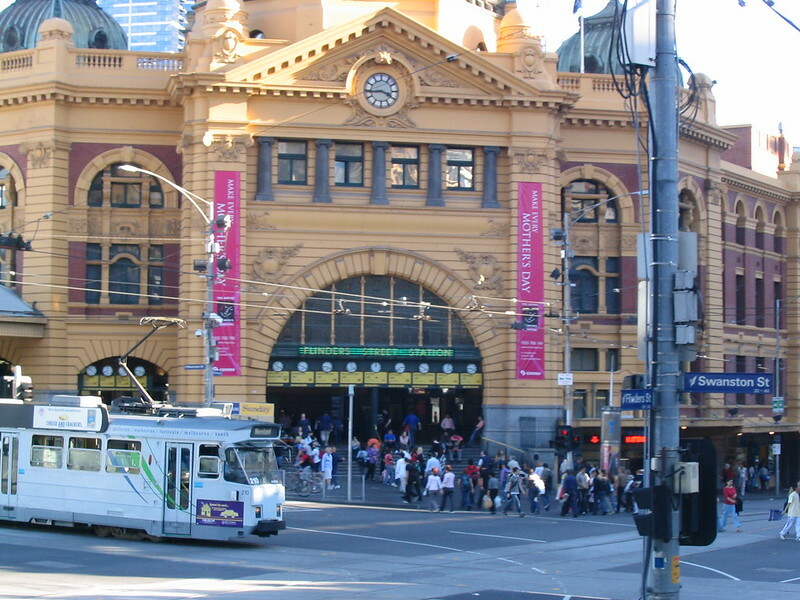 A tram in the old battleship grey colour scheme passes Flinders Street station. The same day I snapped that, I also took some photos of the 7 News ticker above Young And Jacksons. The insertion of “7” between each headline made for some amusement. 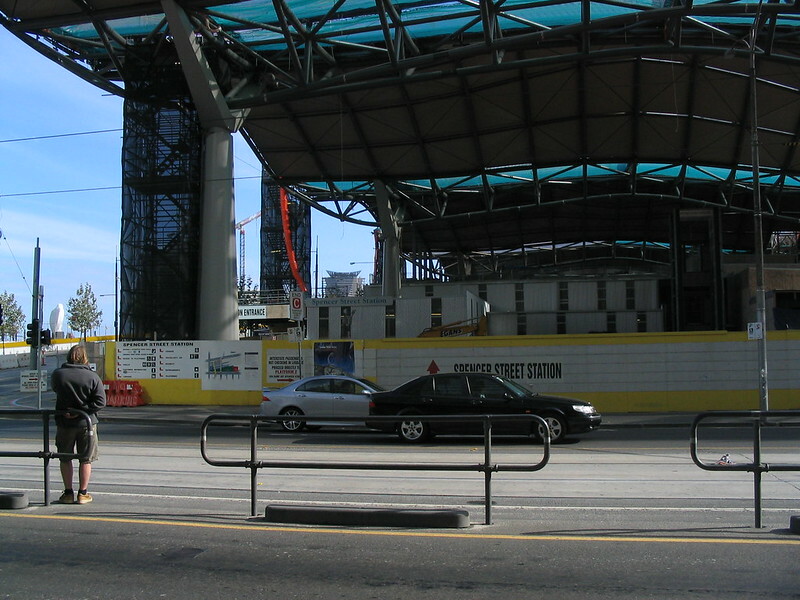 Southern Cross, I mean Spencer Street station under construction. Also note to the left, the empty site now taken by The Age building. Next → Next post: Corrs Lane, Melbourne’s narrowest public laneway? It’s funny how 10 years ago feels so nostalgic. 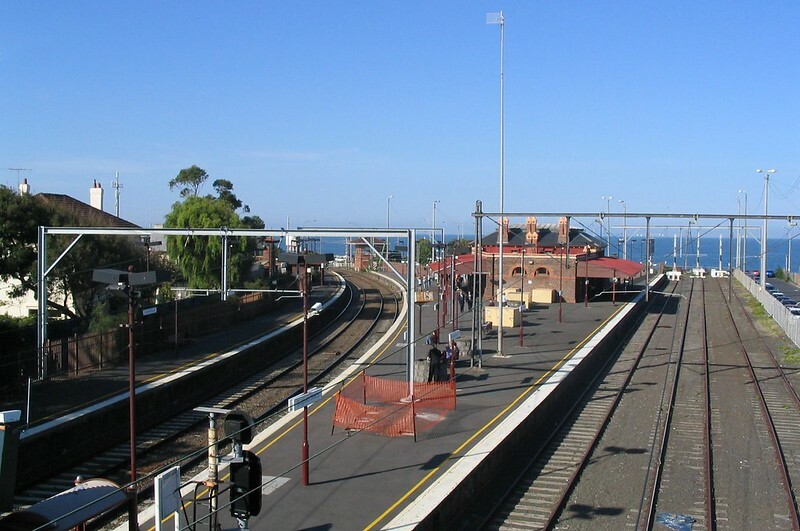 Thanks for the photos, especially of my railway station, Brighton Beach. Annoyingly, the two morning trains that depart from the siding don’t stop at Brighton Beach making it a long gap between trains for commuters at Sandy, Hampton and BB station. @Rod, quite right – thanks! What is the antenna atop the pole on the platform at Brighton Beach station? Such antennas used to be very common on houses 10-15 years ago. Maybe some unknown broadcasting service? 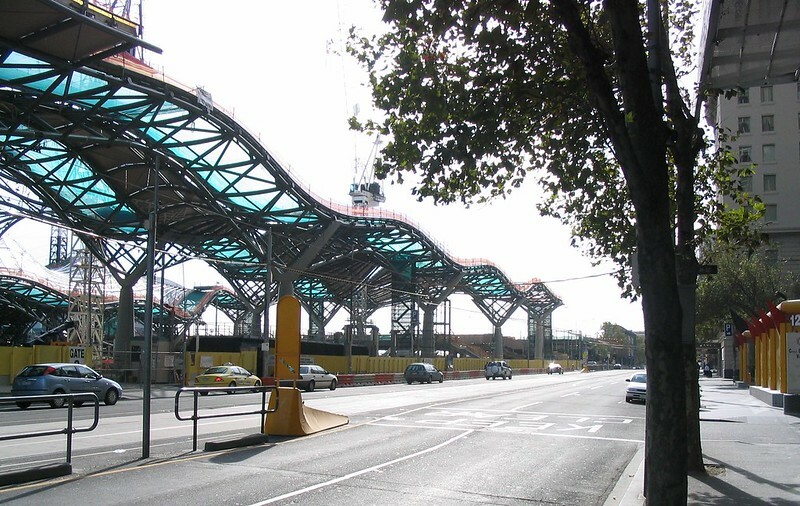 Your photo back then led us to visiting Brighton Beach Station. 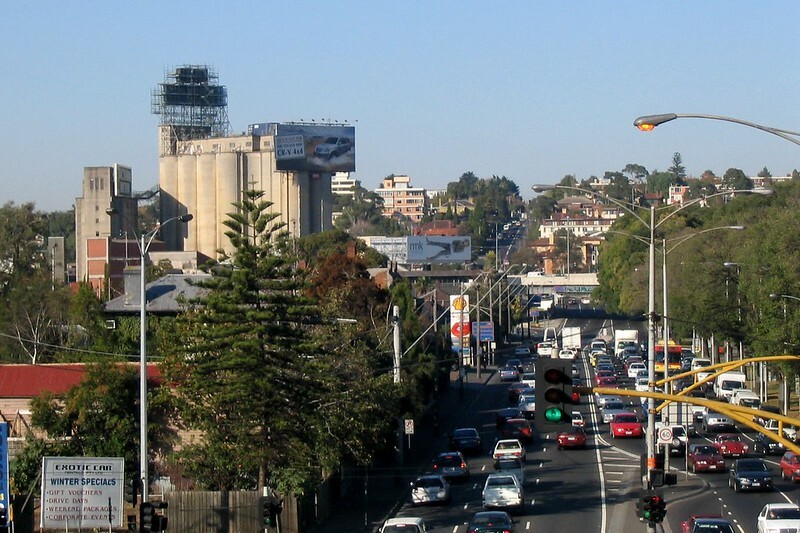 I said to my partner a day or so ago, I think the battle ship grey trams have gone now, but then one passed us by. The 4th photo, were they still working on the roof of the station ? That antenna on the pole is similar, but not identical, to the antennas they used for Galaxy TV which was a pay-tv system that existed for a few years in the late 90’s. Southern Cross Station’s roof looked light and airy and natural when it was half-finished! Now it’s like a dark catacomb in there. Such a waste.